After Jesus gave the Great Commission, died and returned, Jesus shared that He would be departing forever. The Holy Spirit, he said, the Counselor, could come and live with people forever, if they invite the Holy Spirit into their hearts. 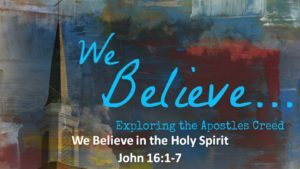 Peter, John and others had invited the Holy Spirit to live within and were able, by the power of the indwelling of Christs’ Holy Spirit, to perform with boldness, miracles and healings. The people expressed amazement at the changes in the Apostles. Peter and others explained that if the people could profess their belief in Jesus Christ and confess their sins, then they could ask for and receive the gift of the Holy Spirit as well.